Sergeant Bowe Bergdahl was freed in exchange for the release of five Afghan prisoners from Guantanamo Bay. THE ONLY AMERICAN solider held prisoner in Afghanistan has been freed from Taliban captivity in exchange for the release of five Afghan detainees from the US prison at Guantanamo Bay, Cuba, Obama administration officials said today. Sergeant Bowe Bergdahl was handed over to US special forces by the Taliban this evening, local time, in an area of eastern Afghanistan, near the Pakistani border. Officials said the exchange was not violent and the 28-year-old Bergdahl was in good condition and able to walk. The handover followed secret and indirect negotiations between the US and the Taliban, with the government of Qatar serving as the go-between. Qatar is taking custody of the five Afghan prisoners that had been held at Guantanamo Bay. Bergdahl, of Hailey, Idaho, had been held by the Taliban since June 30, 2009. The soldier was just 23 at the time. He is thought to have been captured by members of the Haqqani network, which operates in the Afghanistan-Pakistan border region and has been one of the deadliest threats to US troops in the war. The Haqqani network, which the State Department designated as a foreign terrorist organization in 2012, claims allegiance to the Afghan Taliban, yet operates with some degree of autonomy. Officials said Bergdahl was expected to be transferred to Bagram Air Field, the main US base in Afghanistan, for medical evaluations, then on to the United States. Several dozen US special operations forces flew into Afghanistan by helicopter and made the transfer with the approximately 18 Taliban members. The official said the commandos were on the ground for a short time, before lifting off with Bergdahl. According to a senior defence official travelling with Defence Secretary Chuck Hagel in Singapore, once Bergdahl climbed onto the noisy helicopter he took a pen and wrote on a paper plate, the “SF?” — asking the troops if they were special operations forces. Then, according to the official, Bergdahl broke down. The official added that the US still believes that Bergdahl was being held for the bulk of the time in Pakistan, but it was not clear when he was transported to eastern Afghanistan. The five Afghan prisoners from Guantanamo were still at the base as of this morning, but were being transferred into the custody of Qatari officials. Under the conditions of their release, the detainees will be banned from travelling outside of Qatar for at least one year. Officials said Obama spoke with Bergdahl’s parents today, shortly after their son had been taken into US custody. Bergdahl’s family was in Washington on a previously scheduled visit when they received the news. 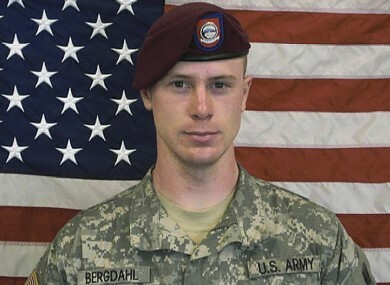 All the officials insisted on anonymity in order to discuss details of Bergdahl’s transfer. Email “Only US soldier held prisoner in Afghanistan freed after five years”. Feedback on “Only US soldier held prisoner in Afghanistan freed after five years”.